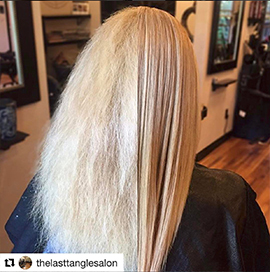 The Color Pro Keratin Treatment is a gentle color treated formula that uses a FLEXSHIELD TECHNOLOGY and revolutionary polymers to surround the hair strand allowing for unsurpassed color protection. Color Pro is the perfect option for delicate blondes and fast fading reds. The Color Pro Keratin Treatment is a UV protectant, color-treated formula. 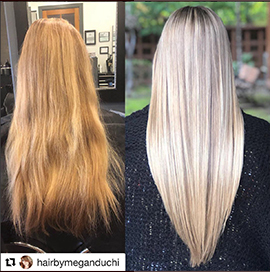 Color Pro forms a breathable barrier over the hair strand, allowing nutrients to penetrate the hair shaft while blocking harmful UV rays and locking in color molecules. 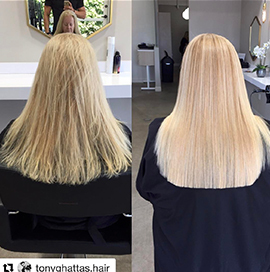 Color Pro is gentle and great for high lift blonds with damaged hair needing delicate attention due to over processing. It’s also great for fast fading redheads, creative colors, and color repigmentation to keep colors vibrant longer. Color Pro contains a unique FLEXSHIELD technology, that includes borage oil and a vitaplex, to protect against premature fading and sun damage while delivering moisture, vitamins, and powerful antioxidants for color that wows!